Evans, 52, listens to a Harrison District resident Tuesday at a National Night Out event. At least 45 excessive-force complaints against him in less than two decades. At least three five-figure settlements in lawsuits accusing him of misconduct. An ongoing criminal investigation into his alleged assault of an arrestee. And a city agency’s recommendation that his police powers be stripped. Despite it all, Harrison District Cmdr. Glenn Evans maintains the support of not only Chicago’s mayor and police superintendent but many rank-and-file cops and West Side residents. Some of them are expressing hope that Evans’ aggressive policing style could help combat crime in the district, which has led the city in homicides over the last year. That hope was palpable this week during National Night Out, intended to help cops across the country build trust with the communities they patrol. 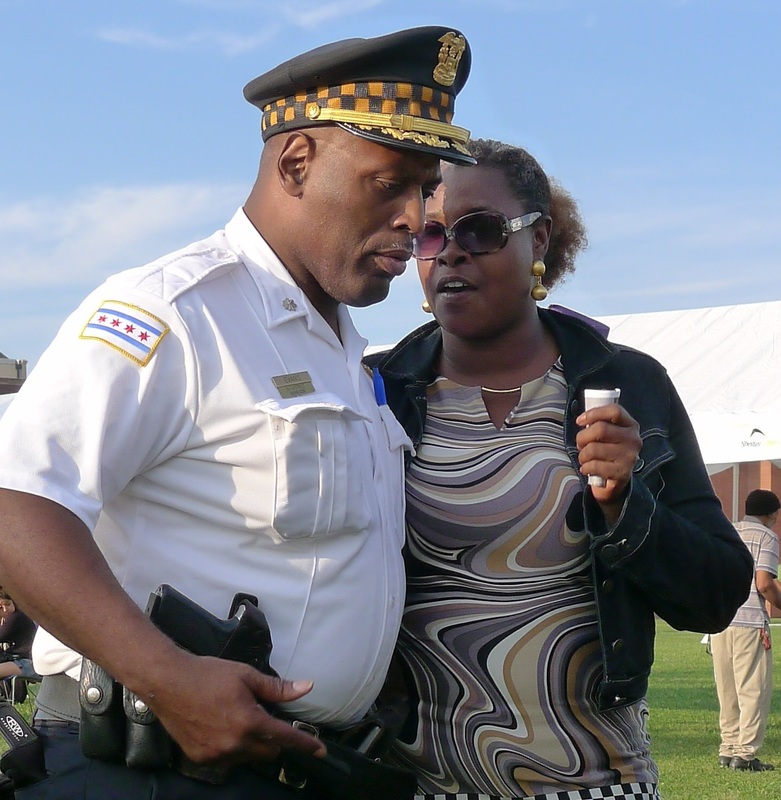 At the Harrison event, a dinner gathering on a high-school ball field near Garfield Park, Evans and other uniformed cops mingled with a small crowd of neighborhood residents while Ald. Jason Ervin (28th Ward) took the microphone. “I want to thank Cmdr. Glenn Evans for his leadership in the last couple months,” Ervin told the gathering. The issue is what happens when Evans goes out on the street. Last year in the Grand Crossing District, his previous post, the commander allegedly jammed his pistol into the mouth of an arrested man and threatened to kill him. A lab test found that DNA on the gun matched the arrested man. In April, based on the test results, the city’s Independent Police Review Authority (IPRA) referred the case to the State’s Attorney Anita Alvarez office’s for criminal investigation and recommended that Mayor Rahm Emanuel’s administration relieve the commander of his police powers pending the outcome of the case, which did not come to light until a WBEZ report last week. And, this week, WBEZ obtained a report tallying those 45 excessive-force complaints against Evans between 1988 and 2008. That total put him on top of a list of 1,541 officers for whom the city provided data. Authorities responsible for investigating the complaints found that two warranted disciplinary action. Do such numbers prove Evans has abused his badge? “More likely, this police officer is out there doing good police work and upsetting criminals,” said a veteran Chicago patrol officer who has worked under the commander. “So he doesn’t expect anything from us that he himself won’t go out there and do, and he’s shown that, time after time,” the officer said. G. Flint Taylor, a Chicago attorney who often represents plaintiffs alleging excessive police force, has a different take on those complaints against Evans. “He is one of the worst, if not the worst repeater cop, in the history of the city of Chicago,” he said. Taylor points out that thousands of Chicago cops have been tough on crime without drawing dozens of complaints, like Evans has. “He should be fired,” he said. Rev. Marshall Hatch, the longtime pastor of New Mount Pilgrim Missionary Baptist Church in West Garfield Park, said the Emanuel administration’s ability to leave Evans in his post, even after the IPRA recommendation, shows what can happen when the mayor appoints all city officials in charge of police accountability. Those include IPRA’s chief administrator, the police superintendent and the Police Board. But the pastor avoided calling for Evans’ ouster. “We want to lend all the support we can to a commander in a district that has so many challenges,” Hatch said. Evans last week declined to comment on the IPRA case. At the neighborhood gathering this week, the commander would not talk with a reporter about the complaints against him. Interviewed at that event, Ervin, the alderman, said he was not taking a stand on whether an officer with Evans’ record should be stripped of police powers. On Thursday, WBEZ asked McCarthy what message it sent to officers to leave Evans in his post after the excessive-force complaints and the recommendation that the commander’s police powers be stripped. The superintendent did not answer. Earlier this week, a police department spokesman credited Evans for a drop in shootings in Grand Crossing last year but declined to answer questions about McCarthy’s handling of the commander. “We take any allegations seriously but, as is always the case, we cannot comment on an ongoing investigation,” the spokesman wrote. Another question is how Evans’ policing style will go over with West Siders in the long term.